All templates encode text as UTF-8 by default. 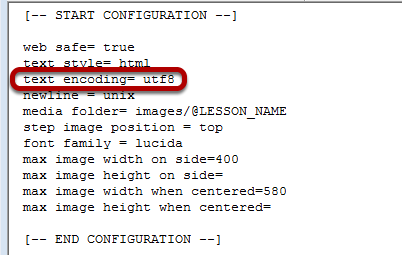 If you are integrating output into a website or system that requires ISO-8859-1 encoding then you will need to change the text encoding property of the template. Locate the text style property. This is an example of what a step title of Téléphone would look like if you were to open an exported lesson in Firefox and view source. Change the text style to 'iso'. Now that 'iso' encoding is being used special characters are encoded using html entities since the characters cannot be represented using the ISO-8859-1 character set. Next: How Do I Add My Company Logo to a Template?